SKAIL STUDENTS’ COLLECTIVE is the umbrella organization of the students. 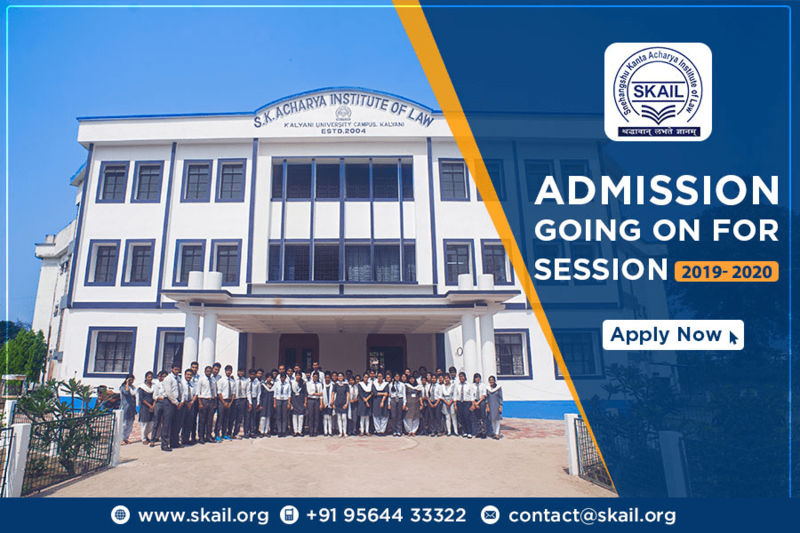 A student on his or her admission at SKAIL automatically acquires membership of SKAIL STUDENTS’ COLLECTIVE. It is a non-political body constituted with the objectives to further academic excellence, to organize various social, cultural and sporting activities and to promote higher standards of self-discipline, harmony and tolerance among student fraternity. 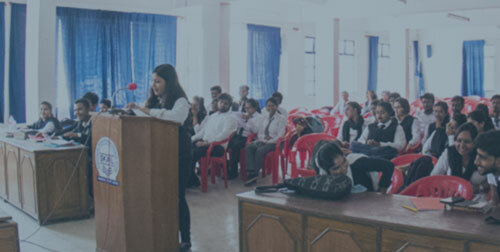 SKAIL STUDENTS’ COLLECTIVE is governed by a constitution and bylaws and it functions under general guidance and supervision of the Faculty Committee. SKAIL STUDENTS’ COLLECTIVE is organized into the following societies and committees to look after various aspects of co-curricular and extra-curricular activities of students. SKAIL encourages student’s participation in various activities – co-curricular and extra-curricular – as a part of students’ total education. The Legal Aid Society will provide legal aid and counseling services to people belonging to low-income group. It will work in co-ordination with the local Bar Association and non-governmental organizations and social action groups active in the field of providing legal aid services and will assist indigent clients in getting appropriate relief. The functioning of the Legal Aid Society will be so structured so as to give exposure to students to various aspects of practical layering and will be integrated with the programme of practical legal training to students as provided in the course curriculum. On invitation from SKAIL, a team led by Addl. C.J.M, Kalyani Court came to the institute on 8th Aug 2006 and held a thread bare discussion with a mighty gathering of students on different facets of legal aid services. Our students not only raised relevant questions taking into account the ignorance, lack of education and abject poverty of large section of the people, and specially, the unfair and cruel treatment meted out to the women in many cases, ranging from dowry to divorce and death.The members of the visiting team encouraged the students for their assuming active role in legal aid services and ensured hearty cooperation at their end. 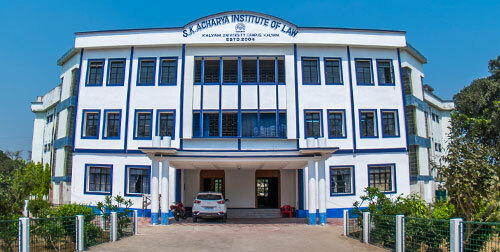 The Legal Literacy Society, in co-ordination with the State Legal Services Authority and other non-governmental organisations and social action groups, will undertake legal literacy projects and will organize legal awareness camps to spread awareness among masses about their legal rights and duties. The programmes will be so designed that it will give opportunity to the students to understand the social base of the legal system. The thrust of these camps and projects will be to address a particular target group in each session. The Moot Court Society will organize moot courts as a part of the clinical education programme. It will also organize moot court competitions at SKAIL and will organize participation of SKAIL students in various moot court competitions in India and abroad. The society will also organize students’ visits to the Supreme Court, various High Courts and District and sub-ordinate Courts, for observing court proceedings and court procedures. Three students of SKAIL took part at the said national level competition on International Humanitarian Law with Mrs. Paramita Dhar Chakraborty, faculty, as team guide. Apart from oral presentation and pleadings in different rounds, evaluation depended on the advance submission of memorial and counter memorial in writing by the students on a problem as sent by the sponsoring bodies. Our Director, Prof. AmitSen took much strain in specially guiding the team, this being a new and advanced area (centering round 1949 Geneva Conventions and their 1977 additional protocols laced with the statutes of the Red Cross and Red Crescent Movement) for our very young students who had to compete with senior students even of LLM level of other 60 universities and institutions. Our Managing Trustee, Sri Milan Sarkar too evinced deep interest in the matter and gave special support to the team with books and additional fund. The team performance of SKAIL earned high appreciation from the judges for the competition. On behalf of the ICRC, Mr Larry Maybe Regional Legal Advisor, in his letter of congratulations, inter alia, praised our team as presenting a high level of arguments. PARTICIPATION OF SKAIL STUDENTS AT THE ALL INDIA SEMINAR ON "ENSURING SOCIAL SECURITY IN A GLOBALISED ERA: ROLE OF CORPORATE AND LEGAL WORLD", HELD IN NEW DELHI, 16TH NOVEMBER, 2007 (FRIDAY) UNDER THE AUSPICES OF LEGAL ASSISTANCE FORUM, NEW DELHI. The Legal Assistance forum, New Delhi invited the institute to participate in the said National Level Seminar. The team sent by our institute, comprising of two students of SKAIL was selected on the basis of their performance as one of the twelve teams for taking part in the final oral presentation in the said 3rd Annual Seminar and All India Law Students Competition. Our participating students secured second position and were awarded certificate of merit, trophy and cash award of rupees five thousand. TThe Legal Research Society will undertake various projects on empirical legal research through field studies, surveys and data collection. The purpose of such projects will be to understand the social base of law and legal system and to provide feedback and give recommendations to policy makers and law makers. SKAIL has already received research projet from The Indian Council of Social Science Research under ministry of H.R.D. Court of India, New Delhi to carry out research project and an advisory committee headed by Prof. Sudhin Mukherjee has already been formed to carry out research project worth of Rs.8,96,550.00 as approved by I.C.S.S.R., New Delhi. The Seminar and Workshop Society will conduct seminars, symposia and workshops on various issues of legal interest. Each of these Societies and Committees will consist of student representatives as selected or nominated by the Director and a member of the faculty nominated by the Director who will be the Faculty Advisor. The student representatives will be selected or nominated by the Director on the basis of recommendations of the Faculty Committee in accordance with the Constitution and By-laws of SKAIL STUDENTS’ COLLECTIVE. The Faculty Committee will give due regards to the academic performance, aptitude and interest in respective field, leadership qualities and class attendance of students in making recommendations. Three students of SKAIL took part in the said National Level Competition and their performance was well appreciated and was noticed by the Judges present there for evaluation. Asian School of Cyber Law, Pune invited SKAIL student to participate in the cyber attack seminar. His performance was highly appreciated by the dignitaries of various cyber cells in India. PARTICIPATION OF SKAIL STUDENT IN THE INDIAN SOCIETY OF INTERNATIONAL LAW 9TH SUMMER COURSE ON INTERNATIONAL LAW HELD IN NEW DELHI UNDER THE AUSPICES OF THE INDIAN SOCIETY OF INTERNATIONAL LAW. PARTICIPATION OF SKAIL STUDENT AT THE 26TH INTER-UNIVERSITY NATIONAL YOUTH FESTIVAL HOSTED BY SHRI VENKATESWARA UNIVERSITY, TIRUPATI. PARTICIPATION AND PRESNTATION OF SKAIL STUDENT AND MRS.PARAMITA DHAR CHAKRABORTY (LECTURER-IN-CHARGE) ON RIGHT TO SOCIAL JUSTICE AND PROTECTION OF ECO-SOC RIGHTS FOR SOCIAL JUSTICE IN THE UGC SPONSORED NATIONAL SEMINAR ON “SOCIAL JUSTICE AND WELFARE STATE:MYTH AND REALITIES” HELD BY DEPARTMENT OF LAW, UNIVERSITY OF NORTH BENGAL. PARTICIPATION OF SKAIL STUDENTS IN YOUTH PARLIAMENT COMPETITION ORGANISED BY KALYANI UNIVERSITY AND OUR STUDENTS HELD THE 1ST POSITION. PARTICIPATION OF SKAIL STUDENTS IN TIMES OF INDIA DEBATE COMPETITION IN THE CAMPUS OF KALYANI UNIVERSITY AND HELD FIRST POSITION. PARTICIPATION OF SKAIL STUDENTS IN THE NATIONAL SEMINAR ON CRIMINAL JUSTICE DELIVERY SYSTEM IN INDIA: RETROSPECT AND PROSPECT UNDER THE AUSPICES OF INDIAN INSSTITUTE OF LEGAL STUDIES. IN 2014 STOOD 1ST IN THE GROUP LEVEL AND RUNNERS-UP AT THE NATIONAL LEVEL IN THE 11TH NATIONAL YOUTH PARLIAMENT COMPETITION. WON THE MOOT COURT COMPETITION ORGANISED BY JYOTIRMOY SCHOOL OF LAW –ANWESHA. WON THE NATIONAL MOOT COURT COMPETITION – LEX – BONANZA 2013 ORGANISED BY INDORE INSTITUTE OF LAW. STOOD 1ST IN THE DEBATE COMPETITION IN LEX BONANZA 2013. STOOD 3RD IN DEBATE COMPETITION AT EAST ZONE INTER UNIVERSITY COMPETITION 2013. STOOD 1ST IN CULTURAL COMPETITION – INSTRUMENTS AT ALL INDIA UNIVERSITY CULTURAL COMPETITION 2013. ATTENDING DIFFERENT COURSES AT INDIAN SOCIETY FOR INTERNATIONAL LAW. STUDENTS INTERNED WITH NATIONAL HUMAN RIGHTS COMMISSION, I P FIRM SCRIBOARD UNDER RODNEY D RYDER, WEST BENGAL STATE ELECTRICITY CORPORATION, CENTRAL BUREAU OF INVESTIGATION, ETC. STUDENTS ARE PARTICIPATING AND PRESENTING PAPER IN NATIONAL, INTERNATIONAL SEMINARS AND CONFERENCES. ACTIVELY PARTICIPATING WORKSHOPS AND LEGAL AWARENESS CAMPS.